We have a lot to thank the British for, but naming hotels isn't one of them. The Brits seem to have developed a very obtuse system of selecting names for public houses, and there are elements of it here too. The Queen's Arms (to pick an unusual name) have what to do with me having a quiet ale in a tavern? I'll use my own Warwick Farms thanks Liz! There used to be a King's Head Hotel in Sydney. "Where's the King's Head?" people would ask. The most frequent response to that was "Three feet from his arse!" As well as royal anatomy, animals seemed to be heavily favoured too. The Golden Stag, The Black Swan - you get the drift, I'm sure. At least that wildlife can be found in England, but a recent hotel name here in Brisbane is "The Elephant & Wheelbarrow". Pardon? Where did that come from, I wonder. I suppose if you had an elephant, you'd need a wheelbarrow, wouldn't you? I mean, I've been to Africa, and those elephant pats are enormous. In fact, an ordinary gardener's wheelbarrow wouldn't suffice - you would need a heavy duty one to push along behind your elephant. Here's a recent photograph of The Elephant & Wheelbarrow, which is situated on Wickham St in the Valley. As you can see, it is trying to appeal to a very diverse clientele. Posters for both the FIFA World Cup and State of Origin (and there's a rugby Tri-Nations one just out of picture) to appeal to different sporting groups. Flags of various nations including the United Kingdom, Japan and Ireland beckon backpackers; while the advertisements for Budweiser beer from the United States is an indication of the eclectic group of beverages served inside at the 9 metre-long bar, one of the longest around. And then there's the pokies for those who find that buying drinks doesn't get rid of their hard-earned quickly enough. I'd rather rip up $20 notes and flush them down a toilet, myself; but that's just me. If you look more closely at my photograph above, you will see that the name of the hotel appears in the gables at the top of the picture. Note that the name says Prince Consort Hotel, the original name of the establishment which is pictured below around the year 1936. The original Prince Consort Hotel was built on this site and leased to former stone mason turned publican John Daniel Heal around the year 1863. Heal bought up adjoining properties to enable the construction of a larger premises, and he engaged Richard Gailey to design the new hotel in 1887. The pub was built by William Ferguson for £9,400 and completed in the following year. 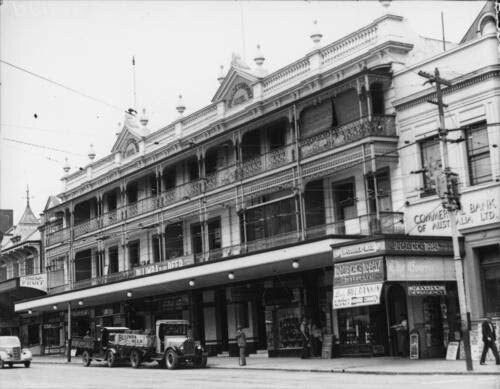 It's a wonder that Fortitude Valley wasn't renamed Gaileyville in the 1880s, as Richard Gailey had also designed the nearby Empire Hotel, the Wickham Hotel, the Hotel Orient and the Jubilee Hotel during this decade. They all are still standing and operating as hotels today. John Daniel Heal became the local alderman for the Valley and also mayor of Brisbane for a time. At a later time the Prince Consort was owned by the O'Connor family, well-known Brisbane publicans. I wonder what they would make of its new name? Although, when you come to think of it, Prince Consort (the husband of a reigning queen - think Prince Philip) sounds vaguely like something the vice squad would be interested in! Richard Gailey really knew what he was doing, didn't he? Even 140 years later, the iron work still looks gorgeous, the columns are slim and the parapet adds a decorative interest that we don't normally see in pubs. But oh that advertising :( I would take the people responsible for the long line of red blotches and the football hoardings, and put them in gaol for the rest of their lives. There is a ton of space at ground level for advertising - why spoil the first floor?. Couldn't agree more Hels! In fact, I think that whatever laws exist to protect these old buildings should include a ban on this sort of disfigurement. Did you know London has a lot of elephants? Queen Victoria had a thing for them. She shipped them over from India and would parade about the city on special occasions. There's an old (disused) elephant house still standing in Mayfair and it's said that when the animals died, they just had to bury them where they lay. Rumour has it, there are a fair few buried all over the city. There are some more above ground at http://londonselephants.blogspot.com/. Still... silly name for a pub, isn't it?